Image caption Mr Clegg said the government's drugs policy amounted to "banging our head against the wall"
Deputy Prime Minister Nick Clegg has accused the Conservatives of refusing to look "imaginatively" at new ways of tackling the UK's drugs problem. 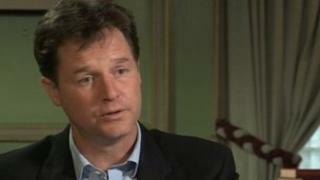 "I don't think we're winning the drugs war," Mr Clegg told BBC Three's Free Speech programme. "I find it very frustrating that my Conservative coalition partners are not prepared to look more openly" at changing drugs policy, he said. Home Secretary Theresa May has insisted the current approach is working. "We keep banging our head against the wall," Mr Clegg continued. But he added: "I don't actually think that waving a magic wand and making everything legal is necessarily the right option." The comments come after Lib Dem ex-transport minister Norman Baker moved to the Home Office in the recent reshuffle. He promised to make Mrs May's department "more liberal" and said he would take an "evidence-based" approach to drugs policy. Labour leader Ed Miliband told Free Speech the answer to the drugs problem lay in better education and prevention measures. "What I do want to say to young people is let's have proper education about drugs in schools so that people understand the dangers of drugs. Let's have early intervention where people are going off the rails through drug use and let's have proper drug treatment. "I don't think the answer is decriminalisation or legalisation, I think the answer lies in better education, better prevention and better treatment." In 2012, Mr Clegg backed calls for a royal commission to consider decriminalising illegal drugs, despite opposition from Conservative Prime Minister David Cameron. "We can't be complacent, we owe it to the many many children in this country who still get snarled up by drugs, whose education chances are blighted by drugs, whose health is damaged by drugs, we owe it to them to constantly restlessly look for better ways of dealing with the scourge of drugs," he said at the time. Mrs May has said calls for a public debate on what could be done differently are "unnecessary". There were "promising signs" that progress was already being made and the "drugs landscape had been transformed", she added.